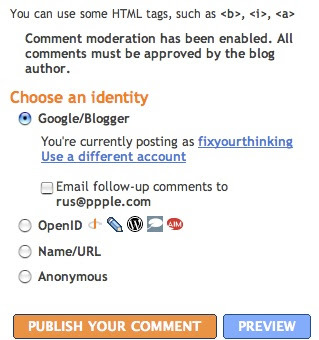 the comments now have the ability to sign with your OpenID. What does that mean? That means that if you have a LiveJournal WordPress TypePad AIM (or an iTunes/.Mac) account you can leave that name instead without registering for blogger and without leaving an anonymous comment. Of course if you have a Google account you can always use that too. You have a Google account if you have a blog on Blogger (blogspot), have Gmail, have ADsense, or use the iGoogle Personalized HomePage. You can also just type in your OWN name and a URL for your site or your favorite site. While I encourage everyone to leave a comment here, it's best if you CAN leave some kind of calling card. Doing so will also help YOU keep track of your comments here and know when or if I or any other commenter responds.